"From the lark to the elephant"
If you want to hunt the woodcock, I can make a rifle-shotgun (double-shotgun) or an ultra-light overlaying shotgun; if you prefer to hunt a wild boar, I can make a slug; for the wild-fowling, a fowling piece; if you like to hunt on a mountain, a removable rifle (takedown); and if you prefer Africa, I can make you an express. 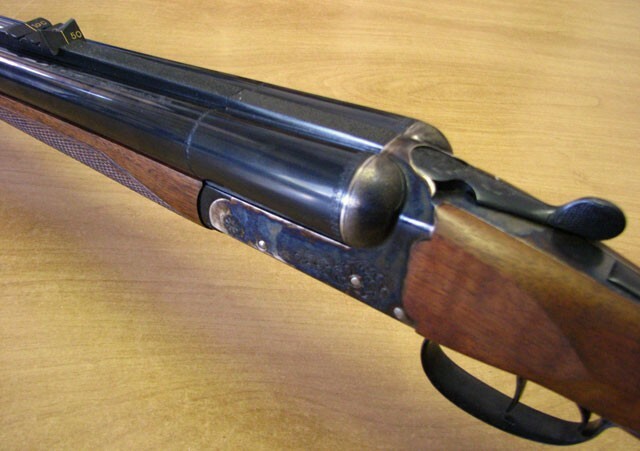 A shotgun that easily allows you to hunt anything from THE lark to the elephant. If we hypothetically travel around the world hunting eighty different animal species, starting from the Piemonte to hunt hare, duck, wild boar and so forth, and then move to Eastern Europe, where my friend Fulvio lives, to hunt geese, duck, deer and bear, and then to Africa to hunt leopard, lion, antelope and buffalo, and then onward to Argentina to hunt big wild boar and aquatics, and following that we take a flight to the U.S.A. to hunt the wild turkey and rain deer, and then finally back to Italy for the seasonal passage of the lark and woodcock, and we are not able to carry ten different rifles with us, but we can only bring one, which one would I choose? In the past, famous companies like HOLLAND & HOLLAND, MANUFRANCE, WESTEY RICHARDS, JEFFREY, etc. gathered together on how to solve the problem and partially succeeded. In France, MANUFRANCE manufactured smooth-bore rifles (called "SUPRA") to stabilize bullets to spread the shot area. These barrels nowadays are built in Gardone, where many manufacturers are mounting them on rifles, but they are also wrongfully labelling them "Paradox" (the "PARADOX" was actually designed by HOLLAND & HOLLAND, and it was invented by Col. Fosbery; while they still have the same functionality, PARADOX only refers to the part that rifles the choke). To achieve enough kinetic energy for the bigger animals, 8 gauge was used as this is very powerful (i.e., a heavy weight with strong recoil). 8 gauge was then dropped and replaced by express bullets moving into the nitro powder (i.e., lighter with equal power). Using the PARADOX by HOLLAND & HOLLAND, as the manufacturer quoted, you could hunt the wide range from the snipe to the tiger. 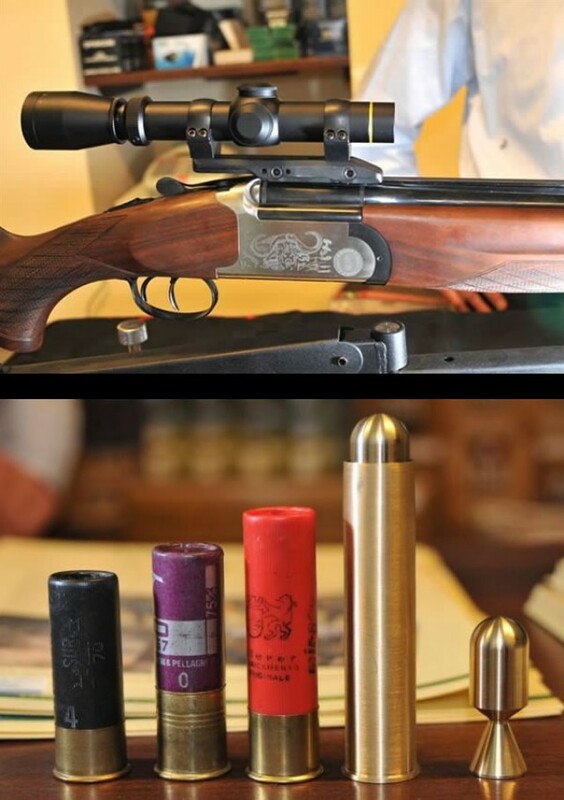 The excellent PARADOX project by HOLLAND & HOLLAND had two main limitations, though: the ball cartridge developed quite low performance levels in 12 gauge (similar to the current slugs). For this reason, they built bigger gauges like the 10 gauge and the 8 gauge. Also, the rifled part of the barrel was fixed and this system didn't allow long shots with pellets, and so it ended up acting like a cylindrical barrel. 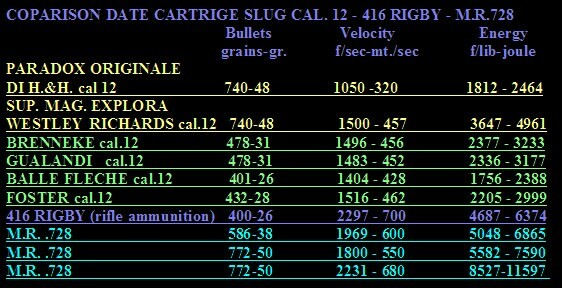 Today, the smooth bore has evolved and, with the 12/89, it is possible to have a light rifle like a 12 gauge with the performance and power of an 8 gauge, with pellet loads from 24 to 70 grains, with different bullets with different weights and shapes from spherical, to the BRENNEKE, slugs, SOUVESTRE (I recall that Pierre Caravati in Selous (Tanzania) shot down buffalos with a SOUVESTRE 12 MAGNUM. With interchangeable chokers we can have cylindrical barrels, choked to different degrees, and for the rifled barrels, we use the PARADOX. With a brass shell case 12/89, the 700 Hell is manufactured in the U.S.A. Find best store from here. Some time ago I did the same by creating the 728 cal. M.R. for the world's biggest revolver (the replica watches uk named "CUCCIOLO"), but now, with this series of rifles, rifle-shotgun (double-shotgun) or overlaying barrels, with different lengths, one is able to shoot any cartridge, 12 gauge, 12 Magnum gauge, 12 SuperMagnum gauge and 728 M.R., skipping PARADOX by HOLLAND & HOLLAND's own limits, and so the rifle that can knock down anything from the lark to the elephant was born. Can shoot far away with pellet cartridges? Can kill elephants in 12 gauge witout using the heavy 8 gauge? It's about an overlayed barrel and a double shotgun, 12/89 gauge that can shoot from 65mm cartridge up to the powerful 728 M.R., reviewed here with a 600 grain solid bullet. High quality Replica Watches UK store for women. With SAUVESTRE-type bullets, long-range shots are possible, suitable to hunt African Antelope, while the specific empennage solid bullet can face even the toughest animals. M.R. 728 UNIVERSAL. THE MOST VERSATILE RIFLE IN THE WORLD.